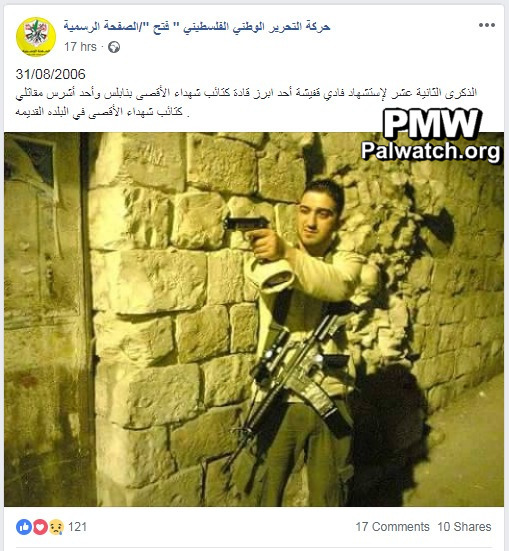 This picture shows terrorist Fadi Kafisha who was responsible for preparing many explosive belts and orchestrating many terror attacks. The 12th anniversary of the death as a Martyr (Shahid) of Fadi Kafisha, one of the outstanding commanders of the Al-Aqsa Martyrs’ Brigades (i.e., Fatah’s military wing) in Nablus and one of the strongest fighters of the brigades in the Old City "
Fadi Kafisha was the Nablus commander of the Al-Aqsa Martyrs’ Brigades (Fatah’s military wing) and one of the most wanted terrorists in the West Bank. Kafisha, who acted under the guidance of Hezbollah, was responsible for preparing numerous explosive belts, and orchestrated dozens of terror attacks. Kafisha was killed in a clash between Israeli army forces and Palestinian terrorists near Nablus on Aug. 31, 2006.